Farming is a profession that has suffered an unfortunate fate over the years in Goa with farmers surrendering their land to barrenness in lieu of fertile and abundant fields. Seen as menial work and fiscally unreliable, few wish to engage in farming. Sandra Fernandes of the Green Growth Institute, Sangolda, is on a mission to change this attitude and replace it with a better understanding and love for farming. Farming is what feeds the people and there is economic gain with patience and the right techniques of farming. Sandra, who has been dubbed the ‘English and exotic farmer’ for her singularity as a highly educated woman with an impeccable fashion sense but without any aversion to working with her hands, propagates the SRI or Systematic Rice Intensification method of cultivating rice. SRI requires less water and is completely organic in nature. The method was developed by Father Henri de Laulanié, a French Jesuit, in 1983 in Madagascar. Our traditional method lacks spacing, with farmers trying to fit the maximum amount of seedlings in one area. This means 10-15 kilos of seeds are needed for just 500 square metres of land. In contrast, the SRI method uses 2 kilos of seeds for 1000 square metres because seedlings are singly spaced. Transplanting done by 12-15 days in SRI results in the seedlings developing even up to 78 shoots. Hence the method is all about intensification ie you yield more than the seed you put in. The traditional way where the farmer waits till 22 days does not let this happen because by 22 days the seedling will have lost its ability to produce shoots. One seedling is planted leaving a spacing of 25 by 25 cm creating a distance of a span on all four sides. This lets the shoots emerge easily without obstruction on the 18th-20th day. ‘Imagine how much you are getting out of that one shoot,’ says Sandra of the intensified growth method. Space is also needed for weeding which is done with a cono weeder that is rolled in between every plant. ‘If you see the growth, you can count the rows. It looks very beautiful when it is grown,’ says Sandra. In the traditional method the farmers wait till the weeds flower and are capable of producing seeds and then the weeds are pulled out and thrown away. This leads to weeds taking root elsewhere and increasing in number. In SRI, after the transplanting weeding must be done on the seventh day, thus ensuring that the weeds have not matured. The cono weeder carries out the dual actions of removing the danger of the weeds and providing the crop with manure by running over the weeds and mixing them into the soil. With this completely organic fertiliser, the need for manure decreases. This weeding has to be done every 7-10 days. 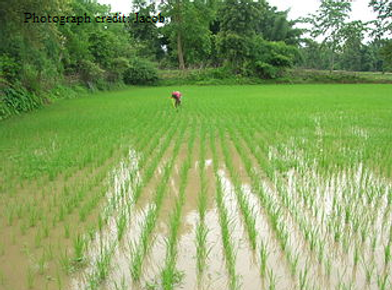 Sandra urges that the transplanting of the seedling should take place as soon as possible because of the tendency in the traditional method to wait for a day or two since the farmers transplant at least a tempo full of rice seedlings. Sandra, who carries all the seedlings she needs in a shopping bag, is amazed at the time that is wasted in unloading the seedlings. She advises that the transplanting be done within a few hours (1½ -2 hours) if possible. ‘Nobody will tell you this, but most of the functions of the seedling will die if left out for too long. By the time the plant revives its functions, you will have lost a lot of days,’ says Sandra. When using the SRI method, the transplanting should not be too deep into the soil. This is to prevent emerging shoots from suffocating beneath the soil. Although the seedlings are planted in a shallow manner, Sandra assures us that the roots take firm hold of the soil within three days and the seedlings will not be uprooted easily. Sandra has experienced her newly transplanted seedlings surviving despite waterlogging during one particular year. Something she has learnt from her relationship with plants is that they survive no matter what if we believe in them, and we as humans can take a lesson from their tenacious nature. ‘That year I had a bumper harvest,’ she says remembering the waterlogged fields. She warns that our own innate feelings can affect plant growth so we have to be positive around them. She says, ‘Even people who know nothing about farming, who have never gone to a field, can do wonders.’ She offers her help to anyone who needs assistance with the SRI method. As part of her NGO work, Sandra gives school children a hands on experience of farming, getting dirty and gritty with mud. For her, education needs to go beyond the four walls of the classroom. It is only when these school children slave in the fields at Sangolda, braving all sorts of weather, that they understand the true worth of the farmer and the occupation of farming. Learning to work together is a character building exercise which is a must for young people today. From the month of June she takes these children through the entire process till the harvest. 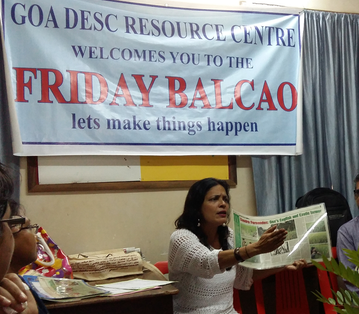 She has children coming from Calangute, Pilerne, Mapusa, Anjuna, etc, but has offered to give demonstrations and similar training to young students in South Goa if the proper arrangements are made. Sandra recalls an incident when, much to her disapproval, a couple of students came armed with gumboots and gloves . She believes that you have to be one with nature in order for nature to work her magic. So she tactfully asked the students if there was something wrong with their hands and feet. She told them they could sit aside and watch the others. But children being children, they soon joined in sans rubber apparel and had the time of their lives. ‘My NGO is all about being one with nature. All of us have a farmer in us. We cannot say nature is not a part of us. Nature can live without us but we cannot live without nature,’ says Sandra. The harvest festival marks the end of the education in farming and the first grain is milled and traditional sweet dishes are prepared for the students to enjoy. Traditional songs and dances are presented by the students and blessings are given by a Catholic priest, a Hindu bhat and a Muslim mullah so that nobody feels their religion is left out. This colourful festival is a means of holding on to our Goan roots and encouraging religious solidarity. To contact Sandra Fernandes, you can call 9975665760.